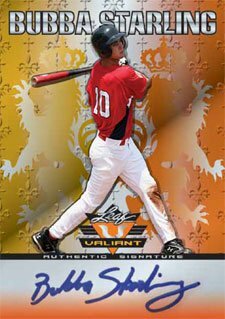 Hot on the heels of 2011 Leaf Metal Draft Baseball comes Valiant Draft Baseball, another prospect-themed set where every card has an on-card autograph. This is the second Leaf set to feature autographs of Ichiro Suzuki. If the cards look familiar, it's by design. Using elements of the popular 1990s Crusade inserts, each card comes with a variety of colored parallels. Single-pack boxes come with ten on-card autographs. Every card in the set is autographed. Ten on-card signatures per pack. Focus is on only top baseball prospects. Second set to include Ichiro autographs. 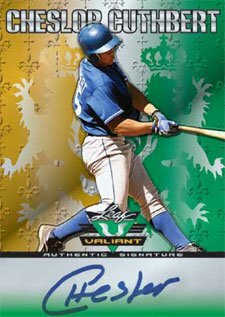 Leaf has exclusive autographed trading card rights to the Mariners superstar. Parallels: Blue, Orange, Black, Red, Printing Plates. The number of cards per pack increased from eight to ten. Production run cut to 320 cases from 400 cases. 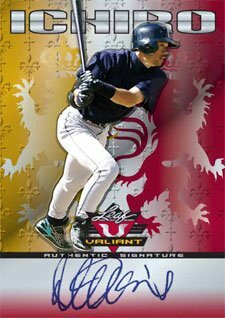 Ichiro autographs inserted 1:3 cases. 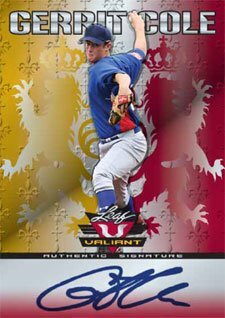 2011 Leaf Valiant Draft Baseball short prints. VA- JB1 Jackie Bradley Jr.